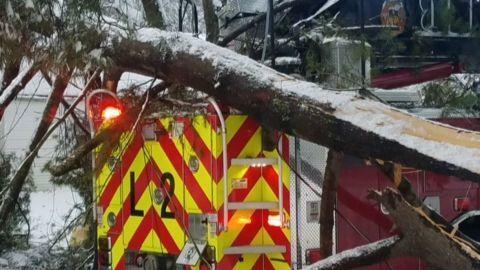 Firefighters rescued a sleeping man from his burning house early Thursday during the height of the snowstorm, the fire chief said. The resident was not injured, but he was displaced from the ranch-style house on Middle Drive that sustained severe damage, Chief John Oates said. The man, who lives alone, had been sleeping and was unaware of the fire, Oates said. A passerby noticed the fire and flagged down a fire crew that was in the area dealing with a downed wire. Those firefighters were able to get the man out and douse the flames quickly, and that may have saved the house from more serious damage and prevented the resident from being injured, the chief said. The house has significant damage to the attic and to a couple of rooms. The American Red Cross worked with East Hartford emergency management officials to find the man temporary housing. Firefighters had just wrapped up their work at the house when a tree fell on one of the fire trucks, Oates said. No firefighters were injured. “It’s certainly better than it could be,” Oates said of the damaged truck, although the repairs are likely to be costly. The tree was removed from the truck about 9:40 a.m., he said.